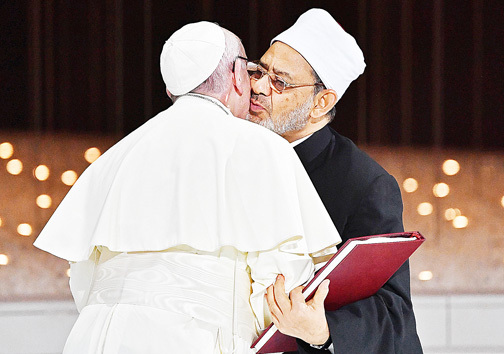 Abu Dhabi—Pope Francis held a historic public Mass for an estimated 170,000 Catholics at an Abu Dhabi stadium on Tuesday on the first-ever papal visit to the Muslim Gulf. “How beautiful it is for brothers to be joined under this sky,” said an MC in Arabic shortly after the pope’s arrival around 10 a.m. (0600 GMT). The son of Italian immigrants who was raised in Argentina, Jorge Bergoglio—or Pope Francis—has paid particular attention to migrants and refugees during his papacy. Tuesday’s Mass came a day after the pope called for an end to wars in the troubled Middle East, including in Yemen and Syria, at a meeting with a top sheik and rabbi in the UAE. All religious leaders had a “duty to reject every nuance of approval from the word war,” he told the interfaith meeting on Monday. “I am thinking in particular of Yemen, Syria, Iraq, and Libya,” he said. He also held talks in Abu Dhabi on Monday with Sheikh Ahmed al-Tayeb—imam of Cairo’s Al-Azhar, Sunni Islam’s most prestigious seat of learning. It called for “freedom of belief,” the “promotion of a culture of tolerance,” the “protection of places of worship” and “full citizenship” rights for minorities.